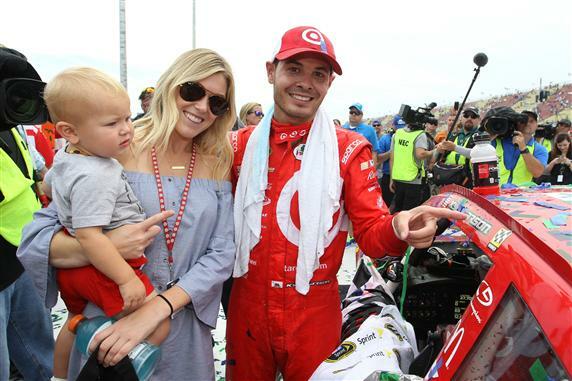 Kyle Larson grabbed the brass ring Sunday at Michigan International Speedway, winning the Pure Michigan 400 and securing a guaranteed spot in the 16-driver Chase for the NASCAR Sprint Cup. The Chip Ganassi Racing driver came to Michigan’s Irish Hills with his back to the proverbial wall, after losing a whopping 59 points to the Chase cutoff in the previous two weeks. A 29th-place finish on the Watkins Glen road course and a 24th the following week at Bristol put Larson on the hot seat, with many railbirds pointing to Michigan as his last realistic chance to earn a berth in the 2016 Chase. Sunday’s win – his first in 99 career Sprint Cup Series starts -- secured that coveted playoff berth, making the Target Chevrolet driver the 13th different winner of the 2016 Sprint Cup Series season. "This means a lot for me and it means a lot for Kyle," said crew chief Chad Johnston afterward. "We didn't start out this year the way we wanted, but we've found speed throughout the year and the kid's got a ton of talent. I think you'll see more to come from Kyle Larson." In addition to punching his ticket to the Chase, Larson’s Michigan victory also left a maximum of just three Chase spots available for non-winners, based on points. When Larson jumped off the hot seat Sunday afternoon, at least four other drivers saw their Chase hopes pushed to the brink. Michigan runner-up Chase Elliott is now 14th on the Chase grid, after losing five spots in the last eight weeks. “I’d be lying if I said I wasn’t (frustrated),” admitted Elliott, who was in position to win Sunday’s race after a stellar final pit stop, only to surrender the lead to Larson when the green flag flew with just eight laps remaining. Behind Elliott, Austin Dillon and Jamie McMurray now own the final two spots in the 2016 Chase. McMurray holds a 27-point edge over Ryan Newman, whose 17th-place showing at MIS dropped him out of Chase eligibility for the first time since Dover in mid-May. The Richard Childress Racing driver has a knack for playing the “Winless Chase Qualifier” card, falling just a car length short of an unprecedented Sprint Cup Series championship at Homestead Miami Speedway two years ago, without the benefit of a single checkered flag. Now, however, Newman is even more of an underdog. With rumors swirling of a post-season departure from RCR in favor of youngster Ty Dillon, the “Rocket Man” needs to recoup half a race-worth of lost championship points in the final two starts of the regular season at Darlington and Richmond. That’s a tough row to hoe, even for a driver used to making the Chase through the back door. For Newman, McMurray, Dillon and Elliott, the next 14 days provide absolutely no room for error. One mistake, one botched restart, one mechanical failure will bring an unceremonious end to their 2016 championship hopes. And another first-time winner at either Darlington or Richmond will throw an already tumultuous Chase grid into absolute turmoil. There are sleepless nights ahead in the Elliott, Dillon, McMurray and Newman households. Dale Earnhardt Jr., driver of the No. 88 Chevrolet SS for Hendrick Motorsports, has not been cleared by physicians to compete in at least the next two NASCAR Sprint Cup Series events, as he continues to recover from a concussion. 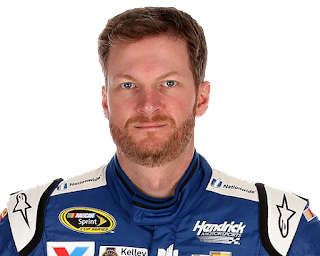 Earnhardt, who will miss the races at Michigan International Speedway (Aug. 28) and Darlington Raceway (Sept. 4), underwent further evaluation today at the University of Pittsburgh Medical Center Sports Medicine Concussion Program. Alex Bowman, who drove the No. 88 Chevrolet in Earnhardt’s absence July 17 at New Hampshire Motor Speedway, will be the team’s substitute driver this weekend at Michigan. He has four career Sprint Cup starts at the track. Four-time NASCAR Cup Series champion Jeff Gordon will return to the No. 88 team at Darlington, where his seven wins lead all active drivers. Gordon has driven the last four races for Earnhardt -- at Indianapolis, Pocono, Watkins Glen and Bristol. 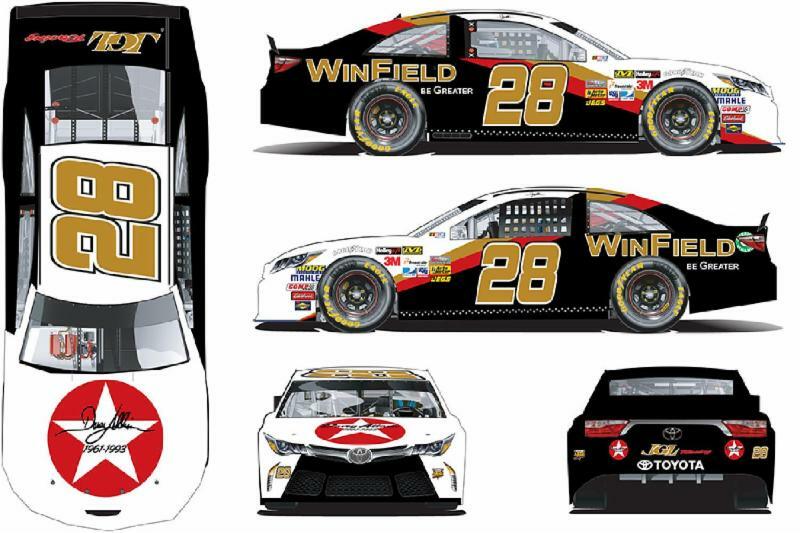 JGL Racing is the latest team to join the “Throwback Party” during Bojangles Southern 500 Weekend at Darlington Raceway, unveiling a special tribute to legendary driver Davey Allison and his historic rookie season of 1987. Dakoda Armstrong will pilot the No. 28 "Davey Allison Tribute" Toyota in next Saturday’s VFW Sport Clips Help A Hero 200 on Saturday. In addition to Allison’s familiar colors, a special Davey Allison Tribute logo will adorn the hood of the No. 28 Toyota, with season-long sponsor Winfield displayed on the upper rear quarter panels. "It is with great pleasure that we pay tribute to one of the legends of our sport," said James Whitener, owner of JGL Racing. 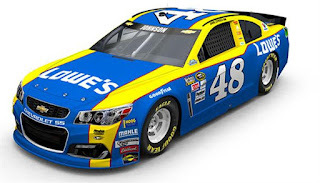 "We had so much success with our throwback scheme last year and we are looking for this years to be even better. I am a fan of this sport as well as a team owner and being able to run the 1987 Rookie of the Year paint scheme of Davey Allison is super special for all of us at JGL Racing. We look forward to representing Davey and his legacy in a first class and professional manner." The 1987 season was a special one for Allison and his Harry Ranier-led team. 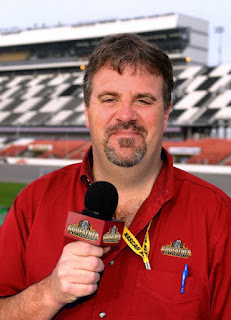 After losing the Hardee’s sponsorship from the previous season, Ranier negotiated a deal with Texaco's Havoline motor oil brand, signing the deal during Speedweeks at Daytona International Speedway. On qualifying day, Allison signaled that he was in Winston Cup to stay, qualifying the Texaco-Havoline Thunderbird second for the 1987 Daytona 500; the first rookie ever to start on the front row for NASCAR's most prestigious event. The pole was the first of five he garnered during his rookie campaign, along with two wins, nine Top-5 and 10 Top-10 finishes. "Robbie, Krista and I are honored that Davey's 1987 Rookie Paint Scheme will be a part of such a special weekend of throwbacks at Darlington,” said Liz Allison, Davey’s widow. "Having the No. 28 on the track in the XFINITY Series with JGL Racing and Dakoda behind the wheel means so much to our family. This paint scheme is what fans remember most of all of Davey's cars. We are truly grateful to have Davey remembered in this way." 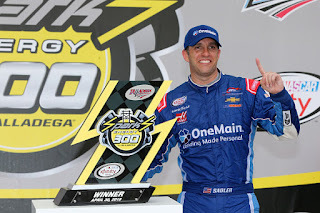 Just days after announcing that they would withdraw from the sport at season’s end, OneMain has reversed course, signing a multi-year extension to continue its sponsorship of Elliott Sadler and the No. 1 JR Motorsports race team in the NASCAR Xfinity Series. 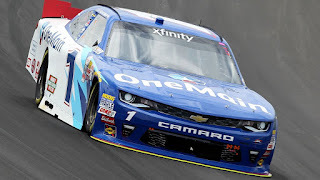 JRM General Manager Kelley Earnhardt Miller confirmed today that OneMain will receive primary branding on Sadler’s No. 1 Chevrolet for 20 races in 2017, marking the seventh year of their partnership with Sadler, the current Xfinity Series points leader. The announcement virtually finalizes JR Motorsports’ driver line-up for 2017. 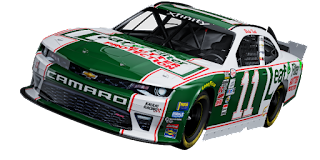 The team will compete for a championship with three full-time entries for Sadler, Justin Allgaier and William Byron, with a fourth “All-Star Car” fielded in approximately six events next season. Sadler has undergone a resurgence in his first year at JR Motorsports. He currently leads the NXS point standings and is preparing to compete in the first-ever NXS Chase format. This year Sadler has one win (Talladega), seven Top-5 and a series-leading 19 Top-10 finishes in 22 starts. He has been an NXS regular since 2011, with a pair of runner-up finishes in the championship point standings (2011-12). “This is a dream come true for me,” said Sadler, 41, from Emporia, Virginia. 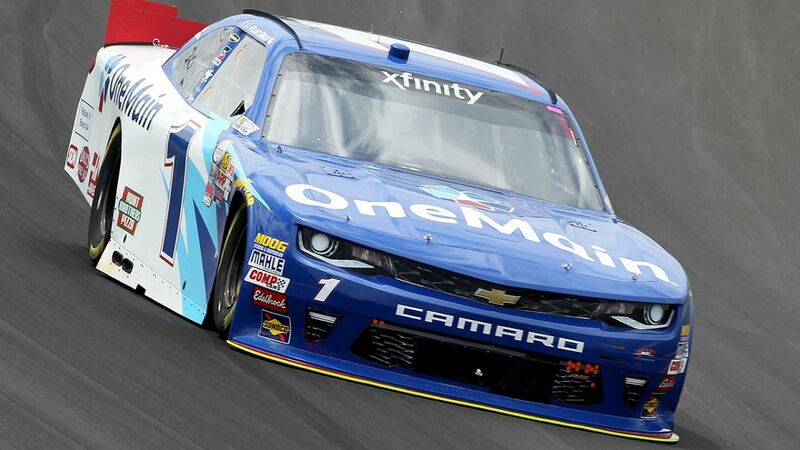 “OneMain is a great partner and we're fortunate to have this stability moving forward to compete for race wins and championships for years to come. I'm as energized as I've ever been." On a weekend filled with story lines and plot twists, perhaps the biggest story of the annual Bass Pro Shops NRA Night Race weekend at Bristol Motor Speedway was the racing surface itself. In an effort to recapture the competitive fervor of the “old” Bristol, NASCAR and track officials took a page out of the NHRA Drag Racing play book, laying down an 18-inch strip of resin-based traction enhancer in the lower groove of the legendary Tennessee oval. They then dragged tires to lay down rubber in the challenging low lane, further increasing grip and traction. Drag racers have long utilized traction-boosting compounds and the aptly named “Tire Dragon” in an effort to glue their fire-breathing, nitromethane guzzling, 10,000-horsepower dragsters to the race track. 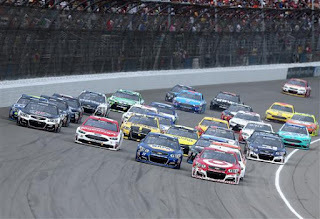 It works for the straight liners, and last weekend, the unprecedented approach worked for NASCAR, producing a dramatic uptick in two and three-wide racing, despite torrential rain storms that repeatedly attempted to wash the track clean. Once a guaranteed sellout, Bristol’s “Last Great Coliseum” had fallen out of favor with NASCAR fans in recent years, following a 2007 reconfiguration that changed the face of NASCAR’s wildest short track. Once a contentious, hot-tempered venue that featured almost as much action after the checkered flag as before it, Bristol was transformed into a genteel joint where helmets were used only as protection, rather than as projectiles. A 2012 decision to grind away some of the track’s progressive banking backfired, as well, reducing Thunder Valley – in the minds of many -- to just another NASCAR track. Tickets that were once contested in divorce settlements and left to family members in wills suddenly became easy to come by, with empty seats all too common. Something had to be done, and fast. Wednesday night’s Camping World Truck Series race was the best seen at Bristol in half a decade – maybe ever – and raised expectations for the remainder of the weekend. An additional application of traction aid prior to Friday’s Xfinity Series run paid similar dividends, and a third coat in advance of Saturday night’s main event also yielded impressive results, despite repeated hosedowns from Mother Nature. Bristol’s pumped-up lower groove generated a substantial increase in the kind of full-contact “rooting and gouging” that made Thunder Valley a can’t-miss stop on the Sprint Cup Series for so many seasons. On a weekend otherwise characterized by torrential rain, Bristol rose like a Phoenix from the ashes, giving the people what they want and raising the optimism bar, sky high. Yes, it’s only one weekend. And yes, it remains to be seen whether a full-blown return to glory is in the offing at Thunder Valley. 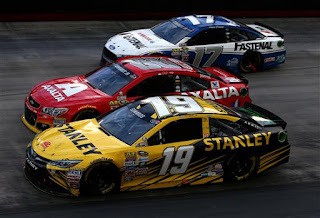 But if the events of last weekend are any indication, it appears that Bristol’s unfortunate “chardonnay era” may be over, replaced by the old school, shot-and-a-beer mentality that previously made a weekend at Bristol Motor Speedway the most anticipated event in all of NASCAR. Other competitively challenged tracks would do well to get Jerry Caldwell on the horn this morning, inquiring as to where they might acquire an 18-wheeled tanker or two, filled with that magical mystery liquid that brought Bristol’s bottom groove back from the dead. And while we’re at it, can we borrow that tire machine? Newly inducted Rock and Roll Hall of Fame band Cheap Trick will headline the New Hampshire Motor Speedway frontstretch stage prior to the NASCAR Sprint Cup Series race on Sunday, Sept. 25. 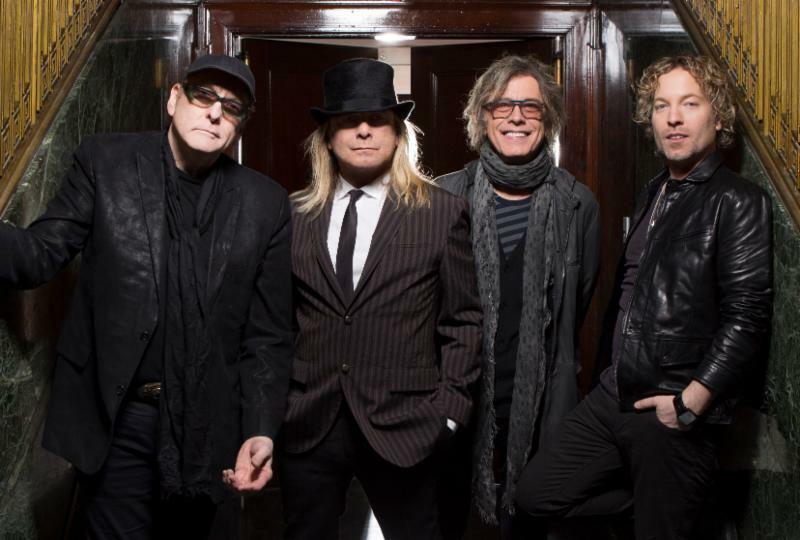 Cheap Trick will perform a 45-minute pre-race concert at 11 a.m. prior to the New England 300, the second race in the Chase for the NASCAR Sprint Cup Series championship. The concert is free for anyone who has purchased a ticket to the New England 300. For stage-front access, Pre-Race Pit Passes are available for fans looking to rev up their race-day experience. Ranked 25th on VH1’s list of the 100 Greatest Artists of Hard Rock, Cheap Trick has more than 5,000 performances under their belts, with more than 20 million records sold. Their songs have been featured on 29 movie soundtracks and they have won 40 gold and platinum recording awards. The Hall of Fame band is made of four musicians: Robin Zander (vocals, rhythm guitar), Rick Nielsen (lead guitar), Tom Petersson (bass guitar) and Daxx Nielsen (drums). Cheap Trick was recently inducted into the Rock and Roll Hall of Fame on Friday, April 8. Now through Sept. 6, New Hampshire Motor Speedway will select three different winners for once-in-a-lifetime experiences at the New England 300 on Sept. 25, 2016. Winners will be selected from current New England 300 ticket holders at the time of the drawing, so the sooner you buy, the more chances you’ll have to win. Anyone that has already purchased tickets will be automatically entered each week. Tickets start as low as $35. To see Cheap Trick perform and for more details and ticket information on events at New Hampshire Motor Speedway, or to purchase tickets to the September New England 300 NASCAR Sprint Cup Series weekend, please stop by our ticket office, visit the speedway website at www.nhms.com, or call the Ticket Hotline at (603) 783-4931. On Saturday, Nov. 26, more than 3,000 car lovers are expected to attend the fourth annual AmeriCarna LIVE Car Show presented by MSC Industrial Supply Co. and Autogeek.com in Davidson, NC. The event will raise funds to benefit IGNITE, the Autism Society of North Carolina’s community center for young adults with high-functioning autism or Asperger’s Syndrome. Former NASCAR championship crew chief Ray Evernham, star of the “AmeriCarna” television series on Velocity, will host AmeriCarna LIVE, along with MSC Industrial Supply Co. and Autogeek.com. The event will feature celebrity cars as well as classic, custom, and collector cars on the Ingersoll Rand North American Headquarters and Corporate Center. A special display of cars from Ray Evernham’s television series AmeriCarna will be on hand, along with cars from the personal collections of NASCAR’s biggest stars -- like Dale Earnhardt Jr.'s Chevy Impala shown at right. The show is open to the public for $5 per person and kids under 10 are free. Car owners can pre-register their vehicles before Nov. 1 for $25 or register after that or at the gate on event day for $30. 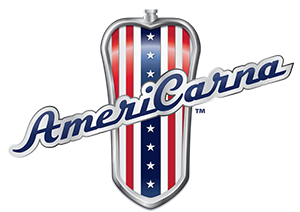 Go to http://www.americarnalive.com to register your car. A variety of food vendors will be available. All proceeds from AmeriCarna LIVE will be donated to the Evernham Family Racing for a Reason Foundation and go to support the IGNITE Community Center in Davidson, N.C. for young adults with high-functioning autism or Asperger’s Syndrome. The event will be located at Ingersoll Rand’s North American Headquarters and Corporate Center on 800 Beaty Street in Davidson, NC; 28036, located on the edge of Lake Davidson adjacent to Lake Norman. Parking is available on the Ingersoll Rand campus. Gates open for car entrants at 7 a.m. and for spectators at 10 a.m.
Cale Yarborough is set to return to the legendary high banks of Darlington Raceway. On Sunday, Sept. 4, the South Carolina native and NASCAR Hall of Famer will pace the field as the honorary pace car driver for the 67th running of the NASCAR Sprint Cup Series Bojangles’ Southern 500. Yarborough has five career wins at his hometown track, all coming in the Southern 500 on Labor Day weekend (1968, 1973, 1974, 1978 and 1982). He won three consecutive NASCAR premier series championships from 1976-78. He also won four Daytona 500 races and posted 83 career NASCAR Cup Series victories with 69 pole awards. Yarborough also will be honored by Darlington Raceway with a special ceremony during the Bojangles’ Southern 500 race weekend for his contributions to the sport. Details on the ceremony will be announced at a later date. He is also set to participate in the Bojangles’ Legends Breakfast on Sunday morning, along with other NASCAR Hall of Fame members. He was elected to the NASCAR Hall of Fame as part of the Class of 2012. Hendrick Motorsports secured its future today, signing NASCAR Camping World Truck Series point leader William Byron to a multi-year driver agreement. Byron, whose five Truck Series win this season is already a series record, will race full-time in the NASCAR XFINITY Series for Hendrick Motorsports affiliate JR Motorsports, beginning in 2017. 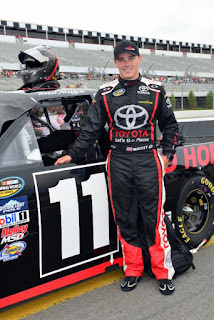 Byron, 18, won the NASCAR K&N Pro Series East championship in 2015,and through 13 races of his rookie Truck series campaign driving for Kyle Busch Motorsports, already owns victories at Kansas, Texas, Iowa, Kentucky and Pocono. Byron has past ties with JR Motorsports, after winning two races with JRM’s Late Model program in 2014 and 2015; his first seasons in full-sized stock cars. Tide and Joe Gibbs Racing will bring back one of the most iconic brands in the history of NASCAR for the Bojangles’ Southern 500 at Darlington Raceway on Sunday, September 4. 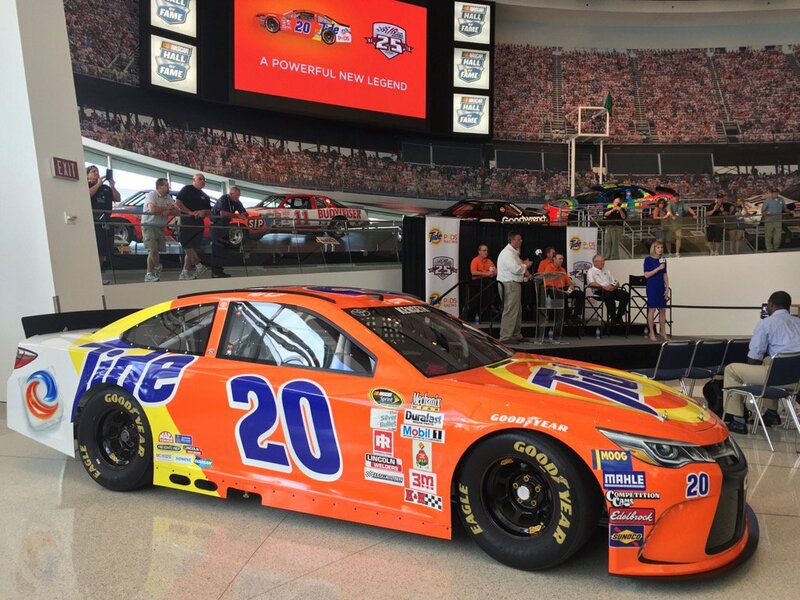 Tide’s unforgettable orange and yellow paint scheme was reborn today as the Tide PODS Toyota Camry, to be driven by Matt Kenseth in the Labor Day Weekend classic. 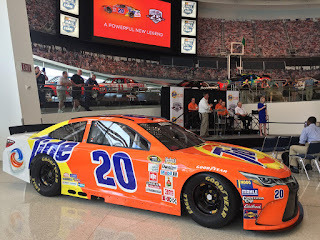 For 20 years, an entire generation of racing fans cheered for the iconic “Tide Ride.” Driven by some of the sport’s legendary figures, including Darrell Waltrip, Ricky Rudd and Ricky Craven, the car amassed 20 total wins from 1987 to 2006. Each driver contributed a fabled chapter to the Tide Ride story— Waltrip’s famous victory lane dance following his Daytona 500 win in 1989; Rudd gutting out a win at the 1997 Brickyard 400; and Craven capturing the closest win in the sport’s history (.002 seconds) at Darlington in 2003. As the newest driver to compete for Tide, Matt Kenseth brings nearly 20 years of experience in the NASCAR Sprint Cup Series, including 38 wins and the 2003 series championship. Tide will also serve as an associate sponsor on the remaining three Joe Gibbs Racing Toyotas of Denny Hamlin, Kyle Busch and Carl Edwards for the Labor Day weekend event. Additionally, the Nos. 18, 19 and 20 entries will carry Tide as an associate for the following two events at Chicagoland Speedway and Richmond International Raceway. Bubba Wallace’s No. 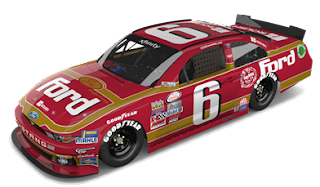 6 Ford Mustang will carry a Retro 1990-91 throwback scheme that mirrors the colors of NASCAR Hall of Fame driver Mark Martin’s No. 6 Ford Thunderbird. 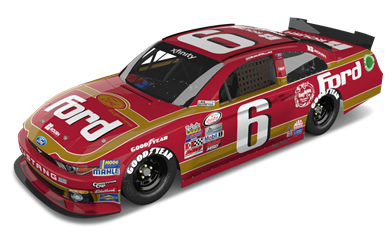 The paint scheme also pays homage to Ford Motor Company, who has provided manufacturing support to Roush Fenway since it launched its NASCAR operation in 1988 and has worked hand-in-hand with iconic team owner Jack Roush since the late 1960s. Martin led 1,111 laps, won four races and posted 40 Top-10 finishes during the 1990 and 1991 seasons, with sponsorship from Folger’s Coffee. He finished second in the Sprint Cup point standings during the 1990 season and sixth in 1991. 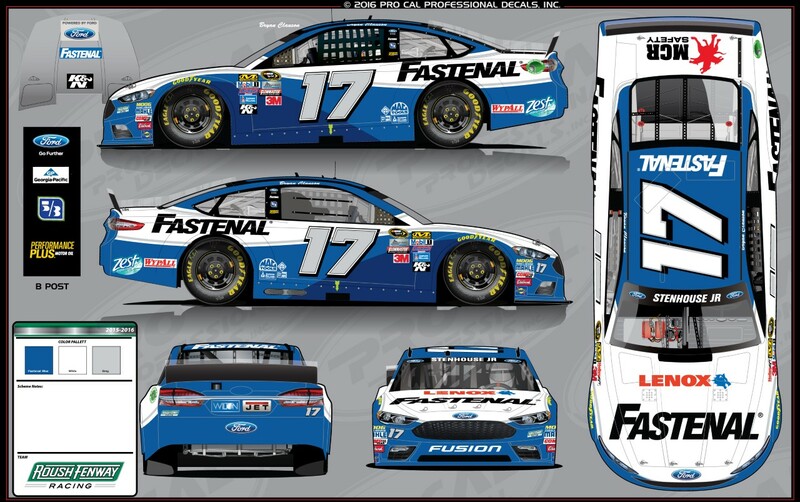 Ricky Stenhouse Jr. will pay tribute to his friend, the late Bryan Clauson, this weekend at Bristol Motor Speedway by running the Fastenal scheme that Clauson raced during the 2008 NASCAR XFINITY Series season. In 2008, Fastenal served as the primary partner for Clauson’s No. 40 Chip Ganassi machine. In his 21 starts, he scored one pole award at Daytona International Speedway and one top-five and two top-10 finishes. In seven starts at the World’s Fastest Half-Mile, the two-time NXS champion has scored two Top-5 and three Top-10 finishes. 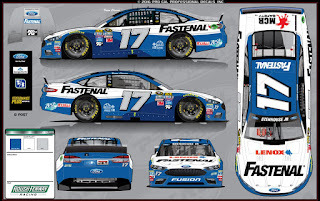 Stenhouse earned his best career finish at Bristol Motor Speedway in 2014 finishing second behind former Roush Fenway teammate Carl Edwards, after an unexpected caution flag flew with two laps remaining, followed by a rain shower. For the second time this season, NASCAR may be on the verge of instituting a new rule, mandating nothing more than common sense. NASCAR executive vice president and chief racing development officer Steve O’Donnell said last week that the sanctioning body is considering a new addition to its already voluminous rule book, outlawing (or at least reining-in) post-race victory celebrations. 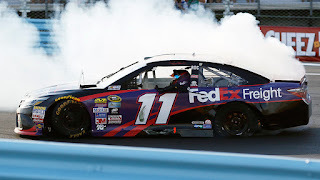 O’Donnell’s comments came less than 24 hours after Watkins Glen winner Denny Hamlin appeared to intentionally destroy the rear end of his winning Joe Gibbs Racing Toyota, smoking the rear tires until they exploded and tore away much of the car’s rear bodywork. O’Donnell called Hamlin’s exuberance “a trend we don’t like to see,’’ acknowledging widespread speculation that recent incidents of tire blowing and body shredding are less about happiness and more about the desire to mask subtle rule violations. Unfortunately, this is familiar territory for NASCAR. Just a few weeks ago, the sanctioning body was strong-armed back into the lug nut enforcement business, after drivers Tony Stewart and Greg Biffle publicly accused them of being soft on driver and fan safety. The end result was cockamamie – and largely unenforceable -- rule requiring all teams to have 20 lug nuts installed and secure, at all times. Currently, section 8.5.2.1.c of the Sprint Cup Rule Book reads; “the first-place vehicle may engage in appropriate celebratory activity (such as a victory lap, burn-out(s) or donuts) prior to reporting to victory circle.” Now, it appears that additional, more specific language may need to be crafted, prohibiting the winning jockey from entering Victory Lane at the Kentucky Derby, then shooting Secretariat in celebration. Despite O’Donnell’s assertion that everyone in the Sprint Cup Series garage is “on board” with the proposed new decree, an informal survey of drivers and crew chiefs at Watkins Glen International revealed that most actually oppose the proposed rule change. This, despite veiled admissions that post-race victory celebrations do indeed include a healthy dose of evidence tampering. Clearly, there’s more happening here than simple celebration. And the longer NASCAR declines to act, the more exaggerated the post-race donuts will become. As they always do, teams will continue to push the competitive envelope until the sanctioning body steps in to pull back on the reins. At the risk of sounding like Walter Matthau in the movie “Grumpy Old Men,” I remember the days when post-race victory celebrations included a lap with the checkered flag in hand, followed by some champagne spraying and the kissing of a Trophy Queen in the Winner’s Circle. Everyone seemed happy, but none felt the need to express their joy by destroying the winning car. Today, however, when the difference between victory and defeat is often measured in 10,000ths of an inch, self-restraint has become passe’. Now, it’s all about “burning them down” and backing the car into the nearest concrete wall, in an effort to mask the subtle (and probably illegal) modifications that brought it to Victory Lane in the first place. With the 2016 Chase for the NASCAR Sprint Cup just a few short weeks away, NASCAR appears ready to act, joining the NFL – dubbed the “No Fun League” for its hard line on all things celebratory – by outlawing post-race hijinks and mandating simple common sense. Soon enough, they’ll be taking undamaged cars to the NASCAR Research and Development Center for Monday morning inspection, and Secretariat will live to run another day. Team Penske will return its NASCAR Xfinity Series operation to a two-car Ford Mustang effort in 2017. The second Team Penske entry will serve as a Ford Performance driver development program as both organizations continue to build for the future. Team Penske’s NXS program ran sparingly between 2001 and 2008, winning nine races with drivers Ryan Newman and Kurt Busch. The team began competing full-time in 2009 and earned the NXS Driver’s Championship with Brad Keselowski in 2010. Since joining Ford in 2013, Team Penske has earned 29 XFINITY Series wins and has won back-to-back-to-back NXS Owners’ Championships. “Obviously, we’ve really enjoyed our relationship with Team Penske and the success that they’ve brought to the Ford family in the NASCAR XFINITY Series,” said Dave Pericak, Director of Ford Performance. “The addition of a second Team Penske XFINITY Series car will allow all of us to work on developing talent behind the wheel and across the board. A driver and sponsorship for the team’s second Ford entry will be announced at a later date. Hendrick Motorsports and driver Jimmie Johnson will salute NASCAR Hall Of Famers David Pearson and Dale Earnhardt, Sr., in this year’s Bojangles Southern 500 at Darlington Raceway on Labor Day Weekend. Johnson will campaign a throwback paint scheme that pays tribute to the No. 2 Chevrolet driven by the pair in 1979. Earnhardt was a rookie that season, driving for car owner Rod Osterlund. When he suffered an injury during the season, Pearson replaced him and drove a Lowe’s-sponsored car to a runner-up finish at Talladega Superspeedway on August 5. Pearson made three additional starts in the car as Earnhardt convalesced, winning the Southern 500 in his final start. Brett Moffitt will return to the No. 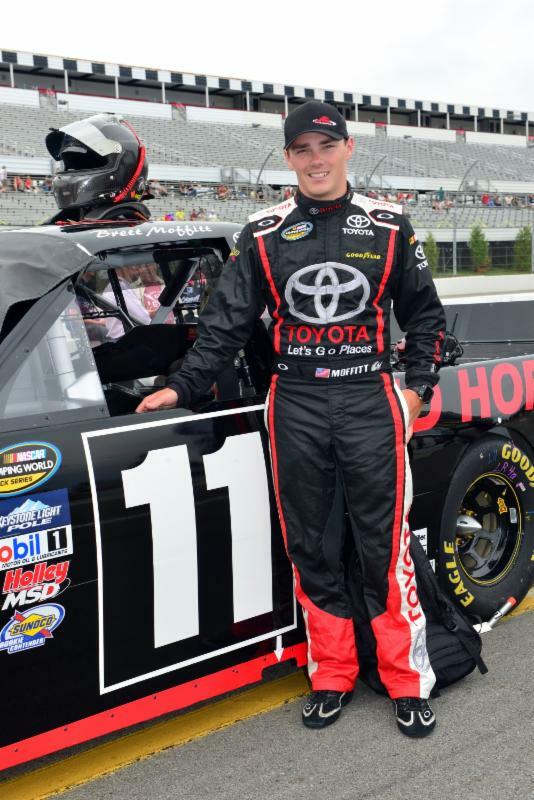 11 Red Horse Racing Toyota Tundra for the next three NASCAR Camping World Truck Series events at Bristol Motor Speedway, Michigan International Speedway and Canadian Tire Motorsports Park. "Brett has done a great job in the No. 11 so far and we're glad to welcome him back to the team for the next three races," said team owner Tom DeLoach. "Hopefully we can continue to ride the momentum that Scott Zipadelli and the team have built and get to Victory Lane." Moffitt has driven the No. 11 Tundra twice this season, once at Kentucky Speedway where an engine failure ended his day early after a strong run, and also at Pocono Raceway, where the 24-year-old finished third. "I'm excited to get back in the No. 11 Tundra," said Moffitt. "I feel like this is a great opportunity and we're on the right track to keep improving and get some strong finishes." The 2015 NASCAR Sprint Cup Series Rookie of the Year has 38 NASCAR Sprint Cup Series starts, one XFINITY Series start and four in the Camping World Truck Series. 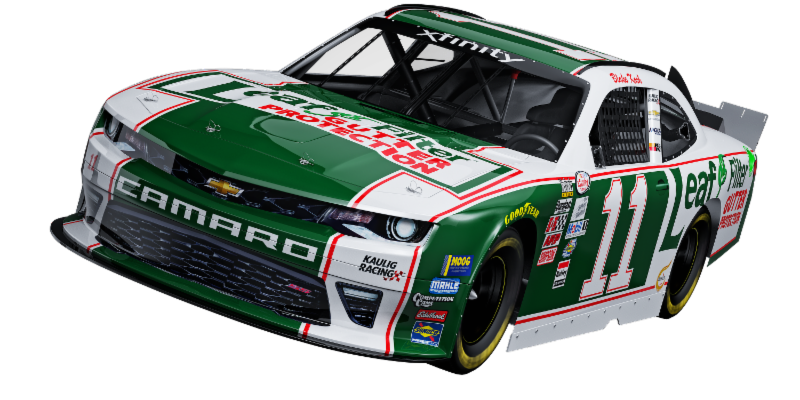 Joining the celebration to honor history at Darlington Raceway, Kaulig Racing will don its usual LeafFilter green with a special twist, paying tribute to Darrell Waltrip's 1981-82 No. 11 Mountain Dew Buick Regal during the NASCAR XFINITY Series VFW Sport Clips Help a Hero 200 on September 3rd. Of Waltrip's 84 career NASCAR Cup Series wins, 24 came with the Mountain Dew paint scheme, including the CRC Chemicals Rebel 500 at Darlington in 1981. Waltrip went on to win his first series championship in 1981 and defended the crown in `82, both with Mountain Dew onboard his Buick. "Running this paint scheme at Darlington is a huge honor for us at Kaulig Racing as well as those of us at LeafFilter," Matt Kaulig, Owner of Kaulig Racing says. "Darrell Waltrip is a true icon in the sport of NASCAR, and his success in the Mountain Dew paint scheme makes it extremely recognizable to both those in the racing industry and fans new and old. In 2015, Darlington Raceway delivered on its first 'throwback' themed Labor Day weekend, and we're excited to be apart of this year's celebration that's guaranteed to be even bigger." Waltrip is tied for fifth with Bobby Allison, Bill Elliott and Cale Yarborough on the track's all-time win list, and Koch hopes the luck of the No. 11 helps to add his name to the list of first time winners at the "Track Too Tough to Tame." "It is an awesome feeling to be a part of something as cool as the throwback weekend at Darlington," Koch says. "It's even cooler to be able to run a Darrell Waltrip paint scheme, a driver who is a legend in our sport. He had a ton of success during his career in the No.11, hopefully we can continue that trend." Stewart Haas Racing announced today that former NASCAR Sprint Cup Series champion Tony Stewart will salute legendary Hall Of Famer Bobby Allison in the Bojangles Southern 500 at Darlington (SC) Raceway on Labor Day Weekend. Stewart and SHR unveiled a special red-and-gold Allison tribute car today, which Stewart will drive in this year's race. The 1971 and 1972 Southern 500s were owned by Bobby Allison. The Hueytown, Alabama native proved to be “The Real Thing” at Darlington, driving his red-and-gold Coca-Cola machine to back-to-back victories at the tough and gritty South Carolina track. Allison dominated from start-to-finish in both races on the 1.366-mile oval, starting from the pole and leading 558 of 734 total laps (76 percent). He paced the field for all but 38 laps in the 1971 Southern 500 and led a race-high 229 laps in the 1972 Southern 500. 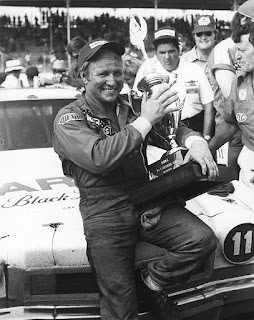 The victories were the first of five premiere series wins Allison earned at Darlington. Stewart will try to emulate Allison’s 1971 and 1972 performances when he competes at Darlington on Sept. 4, in his final Southern 500. Driving a No. 14 Coca-Cola Chevrolet SS that will match the paint scheme Allison drove to those epic wins, Stewart will certainly look the part. 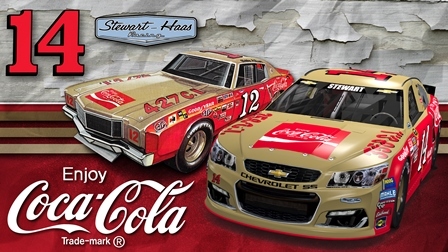 With Coca-Cola’s tagline of that era, “The Real Thing”, emblazoned on the car, the authentic look from Allison’s race-winning cars has been recreated on Stewart’s Chevrolet, right down to the gold wheels and cubic-inch displacement boast on the hood. Stewart is a three-time NASCAR premiere series champion with 49 career victories. Allison is the 1983 NASCAR premiere series champion with 85 career victories. Allison is in the NASCAR Hall of Fame. Stewart is a first-ballot lock for the NASCAR Hall of Fame. “Those red-and-gold Coca-Cola cars were very good to me,” said Allison, who was inducted into the NASCAR Hall of Fame in 2011, the same year Stewart won his third premiere series championship. “From 1970 through 1975, Coca-Cola was on my car and we won a lot of races. We won 11 races in ‘71, the most I ever had in a single season, and then we came back to win 10 more in ‘72. And that first win at Darlington – it was such a tough track and such a long race – it meant so much. 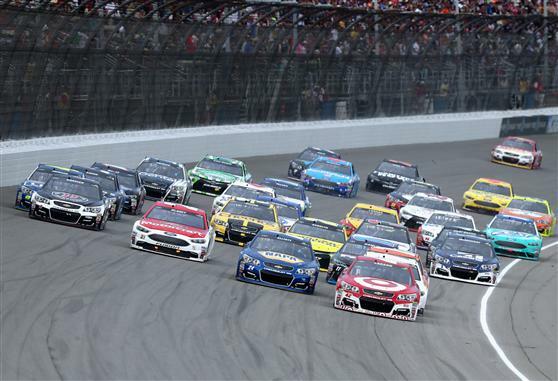 Darlington is one of only two venues where Stewart is winless in NASCAR’s top division. In 23 career premier series starts at the track, Stewart’s best finish is a third in the 2009 and 2012 Southern 500s. Coca-Cola, with a NASCAR lineage that goes back more than 50 years, has been a part of Stewart’s NASCAR career since his rookie season in 1999. “We are humbled by moments like today when two of NASCAR’s most respected drivers come together over an iconic car emblazoned with our brand,” said Ben Reiling, director, sports marketing, Coca-Cola North America. “Together, we commemorate Coca-Cola's role within NASCAR and honor and celebrate Bobby Allison and Tony Stewart for what they stand for in the history of motorsports."